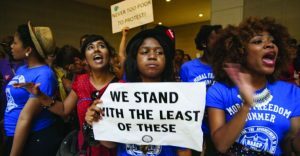 In a report released by Tufts University, 2016 voter turnout plummeted by more than 10 points at HBCUs – from 50.5 percent to 39.9 percent. Only two-years after the election of the very controversial and confrontational President Trump, Kamau Marshall, Director of African-American Media and Deputy National Press Secretary,Democratic Congressional Campaign Committee (DCCC),says that HBCU students are more active and energized to get their vote out and let their voices be heard than ever. Energizing this voting block will make a difference to the outcome of several very important contests this November. Believing in hope and the possibility of change, many historically Black institutions across the nation are taking the reins when it comes to increasing voter awareness and registration among their student body. For example, Howard University, located in the heart of the nation’s capital, registered over 1,200 new voters during the month of August. In states like Florida and Georgia, HBCU participation is at an all-time high, as students and other citizens eagerly await the hopeful election of productive new governors. In the state of Florida, Tallahassee Mayor Andrew Gillum, a Democrat, hopes to become the state’s first Black governor in his campaign against Republican Rep. Rob DeSantis. The race will be one of the most closely watched contests this November, since DeSantis has tied himself to President Donald Trump and defeated other more establishment Republicans. However, Gillum, a firm believer in Medicare for all, has the backing of progressives like Bernie Sanders and the Black community, who were largely responsible for his upset win during the state’s Democratic primary. In the state of Georgia, an Atlanta Journal-Constitution/Channel 2 Action News poll showed that Democrat Stacey Abrams, who is African-American, and Republican Brian Kemp are deadlocked in their race at 45 percent each. Contests like those in Florida and Georgia are ammunition to Michelle Obama’s “When We All Vote,” campaign, which recently announced a series of upcoming “When We All Vote” rallies, targeting students at three HBCUs: Clark Atlanta, Morehouse and Spelman. Though off-year elections are often seen as less important than those held during Presidential election cycles, Marshall insists that voting during this time November is just as important, particularly for Black millennials.